Together we can dispose of sharps safely! Safe disposal for needles and other sharps has been expanded in Jackson County through a partnership between the Ho-Chunk Nation and Together for Jackson County Kids. Ho-Chunk Nation tribal members as well as all Jackson County residents have access to a new sharps drop box where used needles and others sharps can be safely disposed of. Drop boxes are for residential (not business) use only. It can be difficult to find a safe way to dispose of used needles and other sharps. Individuals with diabetes and other health conditions that require use of needles at home are faced with high costs of disposing of their needles. The sharps disposal drop box offers them a safe alternative. There has also been growing concern in the community regarding inappropriate disposal of used needles related to illicit drug use. Family members of drug-addicted individuals need a way to safely dispose of needles to protect the health and well-being of others in the household. Citizens who find used needles out in the community should not touch them as they may carry diseases or dangerous substances. If you find a used needle, please contact local law enforcement officials to pick up and safely dispose of it. Jackson County offers free, secure sharps disposal at the following two locations. Available 24 hours a day, 7 days a week. These containers are for residential (not business) use. 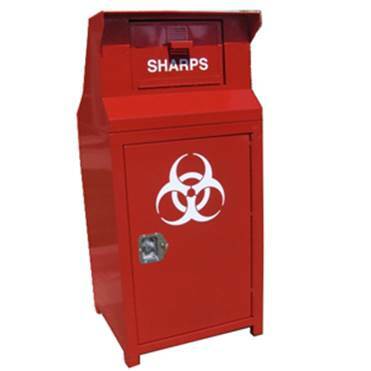 To find additional locations for sharps disposal around Wisconsin, visit the List of Registered Sharps Collection Stations. Use a plastic container with thick plastic and a lid. Free options include empty laundry detergent jugs or thick-walled juice containers. Milk jugs or cartons aren’t thick or strong enough to keep needle tips from poking through. Never overfill whatever container you are using. Overfilling a container increases the risk of being poked with a used sharp. It’s better to start a new container.